Pacific Rimis not a dumb action film. It’s visually sophisticated, complex and, if you like epic sci-fi, it could be the best fun you’ll have in the theatre this summer. Apart from the popcorn and fun there is, in fact, more to this film than watching giant robots battle giant monsters. As it presents a world where ingenuity and humanity is more powerful and important than natural brute strength, Pacific Rim focuses in on themes of cooperation and relying on each other in times of trouble. With this emphasis on human resourcefulness there doesn’t appear to be a spiritual core to the film. But is this true? What spiritual ideas might be buried under all that hulking armour and monstrous flesh? Building on an almost 50-year cultural fascination with the concept of piloted massive robots, Guillermo del Toro has created a vivid live-action mecha anime film unlike any other. Sometime in the future, the ocean develops an unexpected rift along the Pacific Rim. The rift is a worm hole between two dimensions. Through the rift, Kaiju (Godzilla-like monsters) rise up from the deep to attack the world. After conventional munitions prove insufficient, humanity sets aside long held differences to build equally giant mechanized war machines called "Jaegers." Hundreds of engineers, technicians, programmers and mechanics service each massive Jaeger which are operated by two pilots (teams are necessary to avoid the mental strain of piloting such a gigantic mecha alone). With these new weapons, humanity strikes out against its massive inter-dimensional enemy bringing the battle to the creatures before they make landfall. At first everything looks like it’s going well. Early in the film the central character Raleigh Becket (Charlie Hunnam) reflects in a voiceover that “There are things you can't fight: Acts of God. You see a hurricane coming, you get out of the way. But when you're in a Jaeger, you can finally fight the hurricane. You can win.” Ironically, this comment comes just before Raleigh and his brother battle a Kaiju only to lose brutally. His brother dies, their Jaeger is destroyed, and Raleigh is left to work a civilian construction job. he is laid low even at the sight of [Leviathan]. No one is so fierce that he dares to stir [Leviathan] up. The Kaiju of Pacific Rim will not be led around on a leash; they are every inch the Biblical Leviathan and the fight against them in del Toro’s film is won not by technological advancement as much as by the human spirit. The Kaiju are presented as the opposite of humanity—living nightmares of irrational disaster. Unlike Scripture’s Leviathan, the Kaiju are not understood as being part of God’s creation and the idea that there is a God at all is largely dismissed in Pacific Rim. When Raleigh talks about the Kaiju, referring to them as something like an ‘act of God,’ the language is more akin to what you read in an insurance policy. Within the film’s narrative there is no sense there is a God asking questions in the face of the coming Kaiju like you find in the book of Job where God puts forth His question using Leviathan as an illustration. The viewer may be left to wonder if del Toro intended the Kaiju to be a Biblical allusion to Leviathan. If it is, perhaps he wishes to answer God’s question for Job; if not, the Kaiju still can’t avoid being compared to the Biblical Leviathan. Perhaps the pop culture of our day is still freighted with enough Christian capital that such comparisons are inescapable. With its focus on self-consciousness, self-reliance and co-operation, where faith and refuge are found in man and human community apart from anything divine or supernatural, Pacific Rim is the embodiment of many Modern ideas about science and technology. The work of humankind in the face of the natural world and the challenges presented by our surroundings is unspiritual at best and at worst a purposeful rejection of the divine. At one point a military leader (Idris Elba) gives a short but rousing speech saying, “Today at the edge of our hope, at the end of our time, we have chosen to believe in each other. Today we face the monsters that are at our door. Today we are cancelling the apocalypse!” This could be an early 20th century mantra: “With our own self-consciousness we have chosen to believe in each other and we, not God, will determine when and how the story of humanity will come to a conclusion.” The speech answers brashly the question God asks Job in the Old Testament—“If you can’t even deal with Leviathan how do you expect to deal with Me?” In Scripture, Jesus says it’s God the Father who determines when and how the apocalypse will occur; in Pacific Rim man cancels the apocalypse. Although God is largely missing in Pacific Rim, there is a throwaway line about how some people think God sent the Kaiju to punish humanity for its sins. This thought seems connected to the book of Job as well. God having a hand in destruction and retribution is a thought that comes up early in the book of Job when Job confesses this hard truth “Shall we receive good from God, and shall we not receive evil?” Within Pacific Rim the scientists discussing this notion of divine vengeance quickly dismiss the idea as foolishness as they watch people moving into a futuristic Hong Kong temple to worship the Kaiju as God’s Apocalypse. With the dismissal of this line of questioning, the reason for the calamity of the Kaiju is left largely unconsidered and the bulk of the story centres on dealing with the monsters without really asking why the Kaiju are there in the first place. For the main characters in the story God has nothing to do with it and there really is no God to speak of; humans must rely on each other and everything else is counterproductive. While the concept of humanity’s shared war against the Kaiju is depicted in an unspiritual way there are some things that will remind the Christian of Scripture. The Jaegers are entirely manmade instruments only operational due to the involvement of many people. This echoes the concept of the body of Christ: “For as in one body we have many members, and the members do not all have the same function, so we, though many, are one body in Christ, and individually members one of another.” St. Paul teaches that Jesus is the head of the body of Christ. In Pacific Rim the head of the body is operated by the two pilots who are themselves only human, yet they share each other’s burdens and share each other’s sufferings as do brothers and sisters in Christ. While Christians experiences this in living lives of mercy in communion with God and each other, the pilots are technologically joined in a kind of mental handshake that shares memories and experiences thereby forging an emotional bond. The film presents this as being easier to accomplish for family member—father/son teams or teams of brothers. The storyline uses this closeness to develop the ideal that it is the strength of humankind and humanity’s ability to work together, co-operate and risk personal safety for the protection of others which makes the difference. This idea is displayed in the film as a civic form of righteousness. In this scenario, it’s still better to take refuge in the LORD than in Jaegers, no matter how cool a giant duel-piloted robot would be! 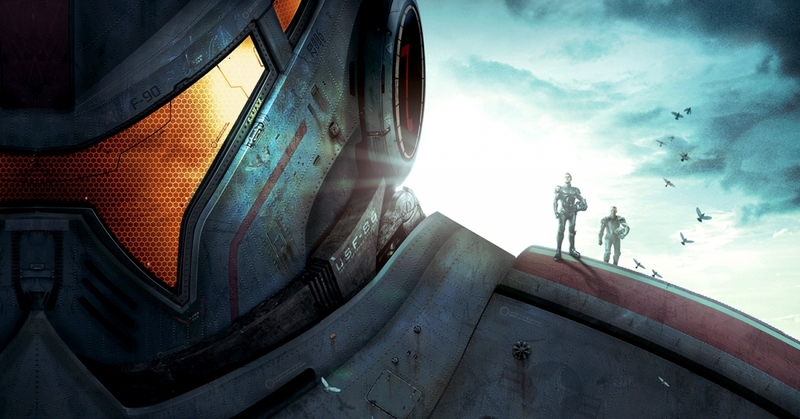 Creatively speaking Pacific Rim is solid and some of the best film fun available this summer. "Jaeger" is the German word for hunter. Colossians 3:1-4, “If then you have been raised with Christ, seek the things that are above, where Christ is, seated at the right hand of God. Set your minds on things that are above, not on things that are on earth. For you have died, and your life is hidden with Christ in God. When Christ who is your life appears, then you also will appear with him in glory. This view of life is often referred to as Modernist or Secular Humanism. In 2 Timothy 2:3-6 St. Paul urges the Christian to share in each other’s sufferings as Christians.